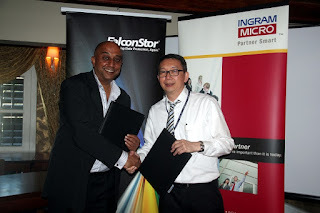 KUALA LUMPUR, March 12, 2013 — FalconStor Software, Inc., a market leader in disk-based data protection, today announced the appointment of Ingram Micro Asia as FalconStor's distributor in the Singapore and Indochina markets. Ingram Micro is a leading wholesale provider of a wide range of computer products in the Asia Pacific region. "We are very pleased with the opportunity presented by FalconStor and look forward to a long and fruitful partnership. We see growth in FalconStor solutions over the years, and we are glad to be working with their innovative team to further this course. We believe the world-class data protection and recovery solutions from FalconStor will prove to be a successful addition to our impressive portfolio of products,” says Francis Choo, executive managing director at Ingram Micro. Commenting on the announcement, Suresh Nair, general manager and vice president of sales and marketing of Asia Pacific for FalconStor, said: “We are delighted to be working with Ingram Micro, who is ideally placed to service an exciting and growing market in which they are widely recognized. We look forward to the collaboration with an organization that, like FalconStor, is a market leader in its industry. FalconStor and Ingram Micro share a strong commitment to innovate and strive further in bringing higher value to our respective stakeholders. We firmly believe that the collaboration will strengthen our position within the data protection, replication and recovery market, as it allows us to capitalize on Ingram Micro’s well-established distribution network." The new partnership will further support FalconStor’s initiative to develop the company’s reach in the region. Ingram Micro will augment FalconStor’s expanding geographical coverage in sales, marketing, training and ongoing support for the Singapore and Indochina markets.